Mr. Steigerwald has worked in education since his graduation from Wayne State University in 1989. He taught English in Detroit at Redford High School and Cass Tech and in the New Hanover County Schools in North Carolina. While teaching he taught everything from ninth grade to senior Advanced Placement English and established the Advanced Placement Language class at Cass. He has also served as a reader for the Advanced Placement Literature Exam and earned a grant from the Nation Endowment for the Humanities to study Shakespeare through performance in Medford, Oregon. After enjoying fourteen years in the classroom Mr. Steigerwald moved into administration when he became curriculum director for Oscoda Area Schools. He later served as high school principal at South Lake High School in St. Clair Shores, Michigan. At South Lake Mr. Steigerwald worked with staff in order to introduce student-centered programs such as character education and the Link Crew program. Under his leadership South Lake increased its Advanced Placement offerings while developing programs aimed at reading and math support. 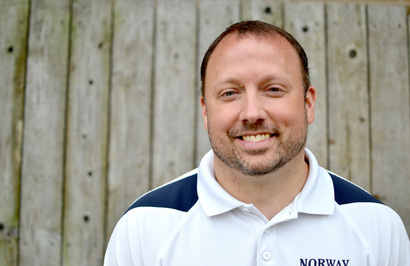 Mr. Steigerwald is very happy to be a member of the Norway-Vulcan community and is looking forward to becoming a part of the tradition of excellence set by Norway-Vulcan students and families. He will be joined by his wife, their two children and their various pets. Mr. Steigerwald enjoys fishing, cooking, running and being outdoors. He will also talk to anyone who wants to talk about literature for just about as long as they could want! His pet peeves include people who refer to or write about themselves in the third person. Mr. Tinti is a graduate of Norway High School. He attended Northern Michigan University and graduated in 2004 majoring in social studies and earth science education. He received a masters degree in education administration and supervision from Northern Michigan University in 2008. Mr. Tinti began his teaching career in 2005 in the Iron Mountain-Kingsford Community Schools alternative education program. From there he taught high school social studies and science for the School District of Niagara. Joe also spent time as Niagara's athletic director and varsity girls basketball coach. Mr. Tinti has been working at NVAS since the 2010-2011 school year. He is proud of the school district he represents and enjoys outdoor activities, baseball, watching sports, and coaching in his free time. 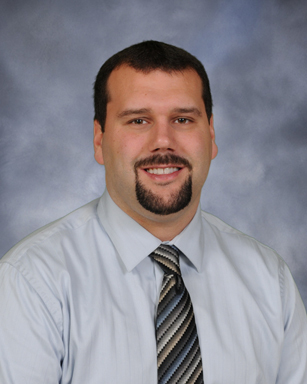 Mr. Meneghini is entering his first year as the K-8 principal at Norway-Vulcan Area Schools. For the past 16 years he has taught Physical Education and Health at NVAS, starting first with K-6 classes then moving to grades 7-12 for the past 7 years. Additionally, he has contributed as a Driver Education instructor, football coach, and more. He is a 1992 graduate of Norway High School, completed his Physical Education and Exercise Science degree from Michigan State University in 1996, and gained his teaching certificate at Northern Michigan University in 2000 and his masters degree in Education Administration and Supervision in 2011. His additional responsibilities include serving as the district's Title I Coordinator and Community Schools Director. Rico lives in Norway with his wife (Amanda) and three children (Marco, Milo, Mario). In his spare time he enjoys spending time with his family and supporting all Norway-Vulcan students in their extracurricular pursuits. "I believe in adapting and learning new technologies. The game changes daily. We need get out of our comfort zones and learn new things. If you can do that, you can do anything.